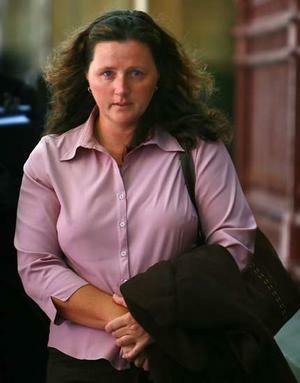 On 30 September 2004, primary school teacher, Claire Margaret MacDonald (pictured as she walks free from court), aged 39 at the time, put on a camouflage outfit and rubber gloves, grabbed her husband's high powered rifle and hid in the bushes near where the family's Land Rover was parked in a paddock on the couple's property in Acheron in Victoria, and waited for her husband to arrive. She lured him to the spot by telling him the Land Rover's battery was flat. She loaded five bullets into the magazine and kept a sixth in her pocket. After about 90 minutes Warren MacDonald came into view. Clair MacDonald followed him in the rifle's telescopic sights until he was about 45 metres away. She fired one shot then another and another until she had fired all five rounds. Warren MacDonald fell to the ground, struck in the neck, throat and back. She then took out the sixth bullet from her pocket, loaded it and fired. As her husband lay bleeding to death on the ground, MacDonald stood over him and berated him for five minutes, telling him how she "hated him for making me do this". MacDonald then tried to cover up her crime by telling police that a rabbit-shooter had threatened her husband the previous day. Only when police began questioning her children did MacDonald change her story and claim she was a battered wife. "He was hurting my children and he just didn't deserve to live. I just wanted him out of my life, out of my children's lives", MacDonald told police. During the trial in the Victorian Supreme Court, MacDonald's defence counsel, James Montgomery, told the jury how Mr MacDonald had "totally dominated" his family, and in particular his wife, through "physical, verbal, psychological and sexual intimidation".Unfortunately the allegations could not be tested in court asMr MacDonald was not around to refute or challenge them. After deliberating for a day, the jury found Claire Margaret MacDonald not guilty on the charge of murder. Amazingly, they also found her not guilty of the lesser charge of manslaughter. In acquitting Mrs MacDonald, the jury accepted the defence argument that she killed her husband in self-defence. The MacDonald case is just one of a number of recent cases where a wife has got away with murdering her husband on the grounds of being a battered wife. Why bother having women's refuges and a myriad of taxpayer-funded support agencies? Why not just issue high-powered rifles to all women who claim to be battered?